Let’s begin by taking a closer look at the design of the S277HK, which is actually quite remarkable. The first thing you notice is the display, which spans twenty-seven inches with ~1cm bezels on the top and sides. The bezel terminates in an faux-aluminium silver frame, which makes for a classy look. On the bottom, we have some more faux-metal embossed with the acer wordmark in the centre. 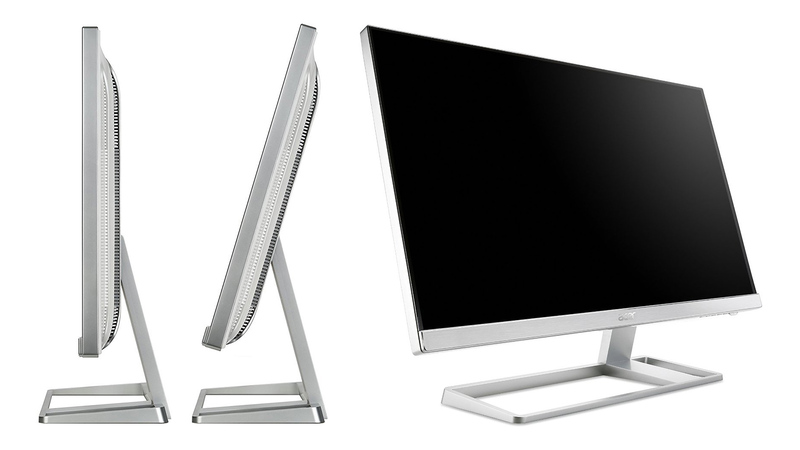 The feeling of elegance also extends to the monitor’s stand, which sports an interesting asymmetric design. While the metal base is centred below the monitor, the stand sits off to the right side. Thankfully, the monitor’s stability remains unaffected. While the stand used is stylish, it isn’t very adjustable. The monitor can be tilted forward and back, and that’s all. You can’t swivel, rotate or adjust the height of the monitor, and there’s no VESA mount for wall-mounting or choosing another stand. That’s a shame, but it makes some sense given the unique stand. The back of the monitor is also unusual, with all of the ports facing directly out. Combined with the careful labels, this makes it very easy to plug in the power, video and audio cables. The a/v ports include DisplayPort, Mini DisplayPort, HDMI, DVI, and 3.5mm audio in and out. 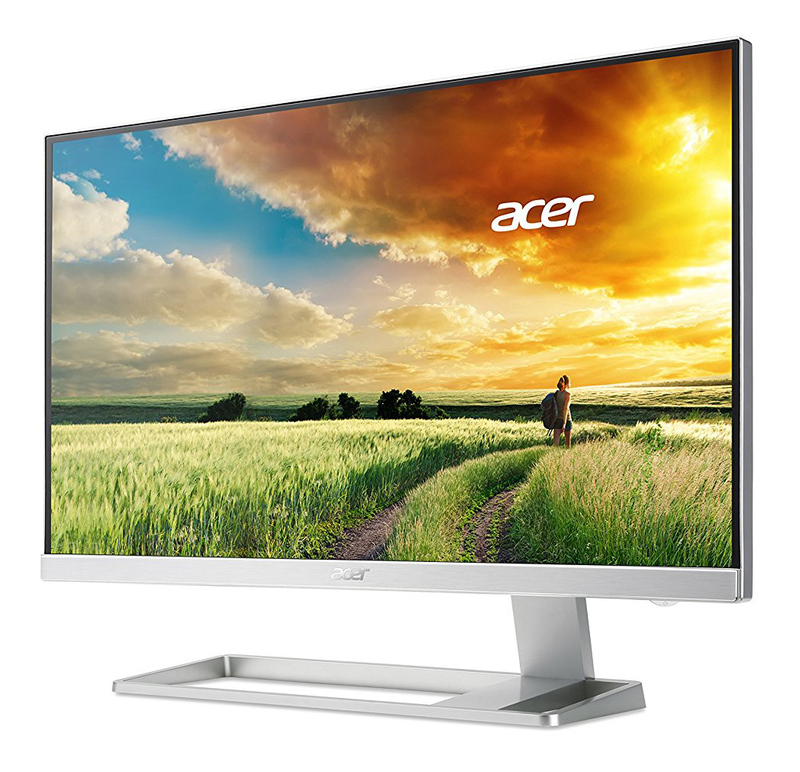 The outright position of the ports does mean that cables are more noticeable and protrude further from the back of the monitor, making the Acer S277HK less suitable for use in environments where anyone can see the back of the monitor — for example, in an open-plan office or a receptionist’s desk. 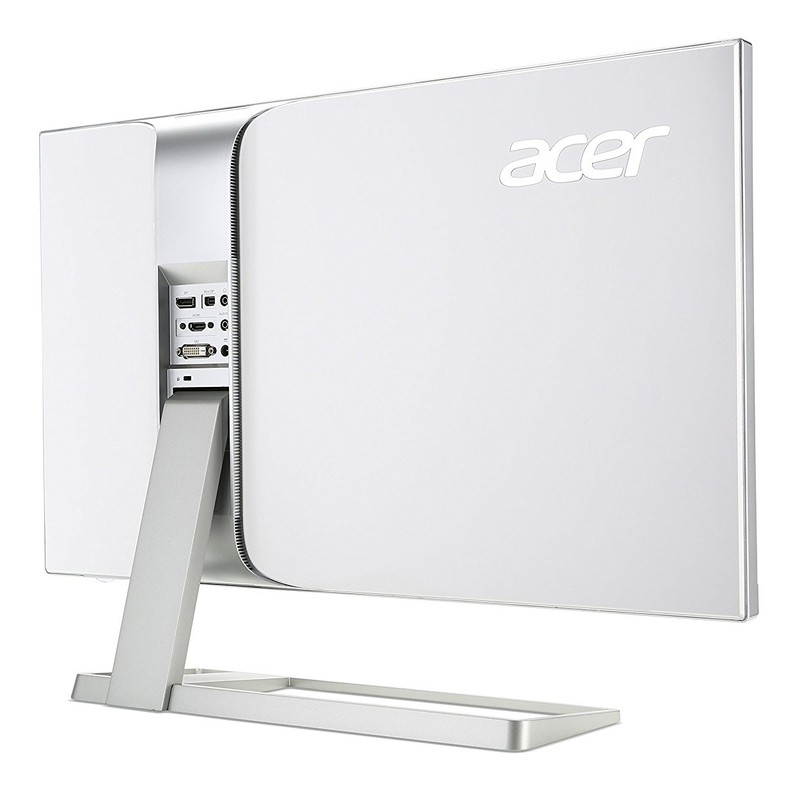 At least the back of the monitor itself looks stylish, with a glossy white plastic design. The monitor is controlled via small buttons on the lower right underside of the screen. There’s a large, easy-to-accidentally-hit power button at the end, with five smaller buttons that allow access to the OSD. These buttons are hard to hit accurately each time, as there are no labels on the front of the monitor to line yourself up with. Thankfully, there are relatively few options to play around with here, and out of the box the monitor is relatively well calibrated. The box comes with the monitor itself, a DisplayPort cable (suitable for the 4K / 60Hz connection you’ll want), a DVI cable and a power cable. In order to give a characterisation of this monitor’s performance, we will use a i1 DisplayPro colourimeter using DisplayCal software. This is the second time we’re using this hardware and software combo, so feel free to provide feedback on the format of the results. As usual, before we perform the benchmarks we’ll be calibrating the monitor as closely as possible to our standard measurements: 120 nits brightness (38 / 100), gamma 2.2 and a white point of 6500K. Here’s the .ICC / .ICM file produced by the DisplayCal software we’re using, if you want to use it yourself. The usual disclaimers apply; panels vary and this may not produce an improved result. In terms of gamut coverage, the S277HK covered 93.5% of the sRGB space (at a volume of 107.7%). This is sufficient coverage for most amateur and professional purposes, although extremely colour-sensitive work might be better done on a monitor that covers the entire sRGB space. 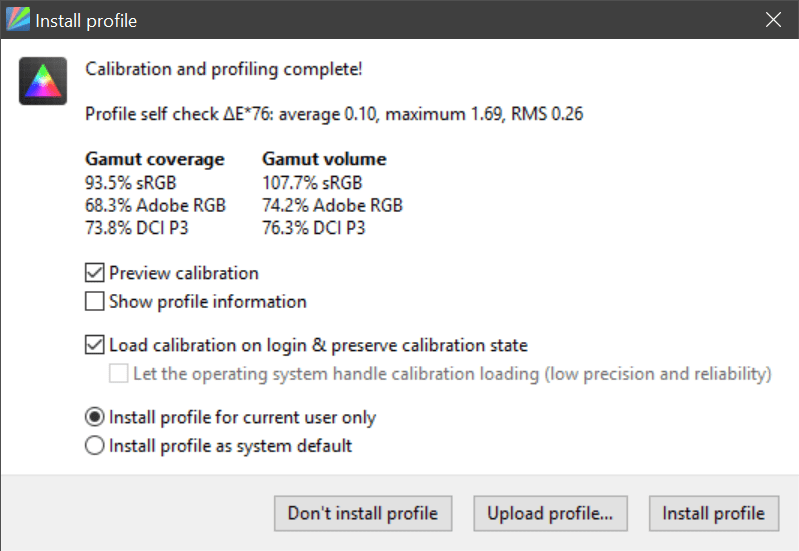 The monitor also covered 68.3% of the Adobe RGB space and 73.8% of the DCI P3 space, two less commonly used gamuts. This accounted for 74.2% and 76.3% of gamut volume, respectively. At our desired 120 nits brightness, we measured a black luminance of 0.1329 nits. That’s enough for a contrast ratio of 888:1, which is a good result if not quite at the level we’d expect to see from contrast-heavy OLED or VA panels. For an IPS screen, 888:1 is pretty decent indeed. 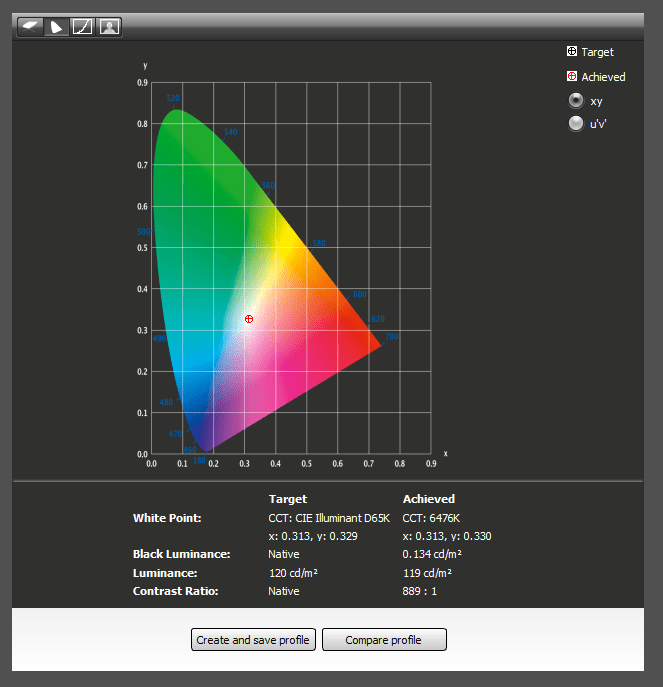 Our white point ΔE was measured at 0.56, showing we’ve hit our desired 6500K colour temperature almost perfectly. 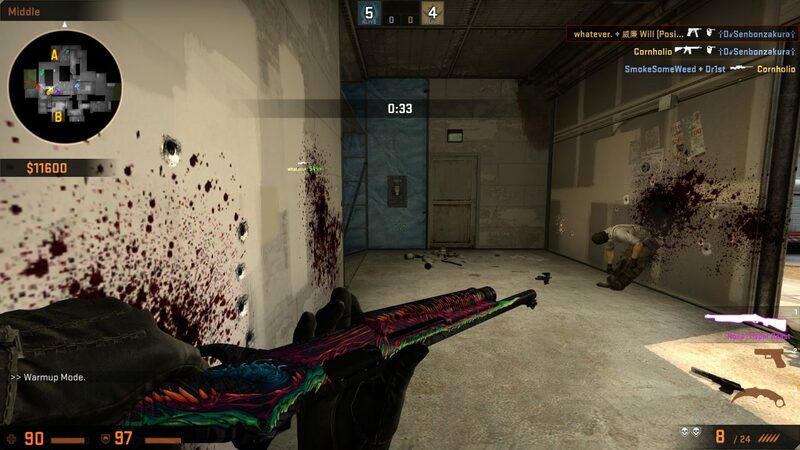 In order to test the colour accuracy, we compared the S277HK against the ColorCheck 24 Patch reference. We got very low average ΔE values, at 1.09. Anything at 1.00 or below is so good that it’s nigh-indistinguishable with the naked eye, so the S277HK meets our requirements for colour accuracy. We can also take a closer look at some of the results. The lowest 90% of patches had an average ΔE of just 0.59, while the highest 10% measured 6.60. Altogether, it’s a really impressive result with just two swatches — lilac and teal — proving problematic. In terms of screen uniformity, we had our first sub-par result. While the monitor showed minimal contrast deviation in any quadrant of our 3×3 test, nominal tolerances were exceeded in the bottom right quadrant. We’re talking ΔE values of 4.73 and 4.02 at 75% and 100% brightness, which is quite a bit more than we’d like to see. This is a disappointing result, but it doesn’t entirely invalidate the monitor for creative use. 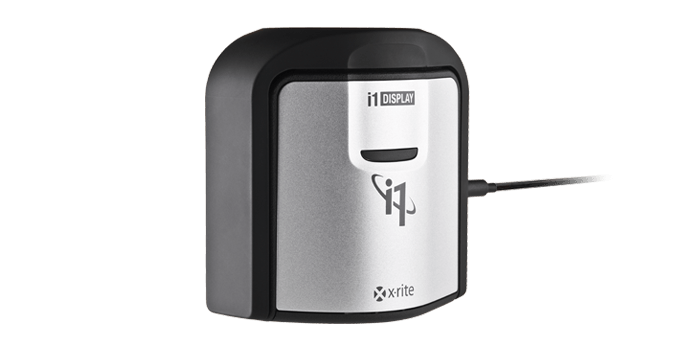 It just means that you should examine the monitor, either by the naked eye or with a colourimeter, to see if your particular panel meets your expectations — something that isn’t necessary for many monitors. Hopefully, your model will show better results than our review unit. The combination of high resolutions and IPS panels is a strong one, as it will suit designers, artists and creatives of all kinds. The 4K resolution is ideal for editing photos or video, or just having a lot of content on screen at once. Scaling, either in macOS or Windows, is recommended given the high resolution. We tried both 125% and 150% scaling, and both provided a nice level of clarity without sacrificing too much screen real estate. 200% scaling also worked fine for using one app at a time. 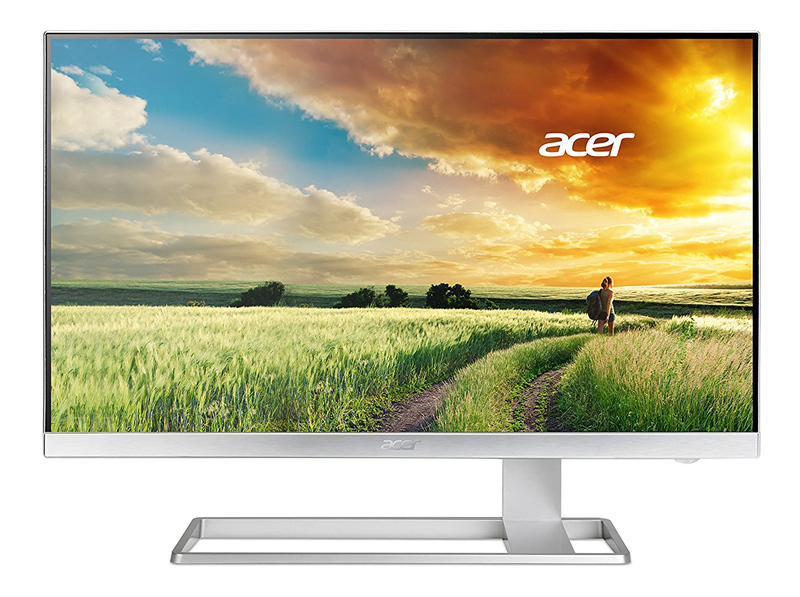 The usual strengths of the IPS monitor are well displayed with the S277HK, with good coverage of the popular sRGB colour gamut, excellent colour accuracy and wide viewing angles. This makes the monitor a good choice for any application where colours need to be seen as they will appear in the final product. It’s also just nice to have, whether you’re browsing the web, watching a video or playing games — scenes are bright and vibrant, without the washed-out look that typifies older and cheaper monitors. Of course, there are downsides to IPS screens as well; these panels are typically more expensive than older TN screens and suffer from worse response rates, but this doesn’t matter much for non-gaming purposes. The S277HK isn’t even that bad for games, with a 4ms response time that should suit slower-paced games like Civilization VI or Divinity: Original Sin 2. However, driving 4K requires a high-end gaming PC, so more competitive fast-paced games don’t match well with this monitor. Apart from the screen itself, the S277HK has few major flaws. It would have been nice to see some USB ports or SD card readers built in, but this would have necessitated a change in design and so their non-inclusion is understandable. Similarly, it would have been nice to get a more adjustable stand; I found the monitor quite low, and ended up resorting to using an old pile of books to get the top of the monitor at eye level. That takes away from the look of the monitor somewhat, but might not matter for desks with elevated monitor stands built in. The S277HK is a stylish monitor suitable for designers and other creatives, thanks to its excellent colour accuracy, sharp 4K resolution and stylish appearance. While more recent monitors might exceeds its specifications, the unique look and recently lowered price of the S277HK (£380) means it’s still worth considering!